Thank you all for another amazing week of submissions and for playing along with us. Although you really made it difficult for the Players to choose their favorites, we are pleased to showcase the Cut Above and Headliner choices! From the trio of ornaments to the gorgeous display of designer series paper, Narelle's card is a fabulous example of the "power of three"! Clean and classy, this card is further enhanced by the flagged sentiment with mini-clip and three strategically placed rhinestones. Narelle has created "card perfection" with this beauty. Congratulations, Narelle for being my choice for A Cut Above! Vicki's amazing poinsettia caught my eye right away. 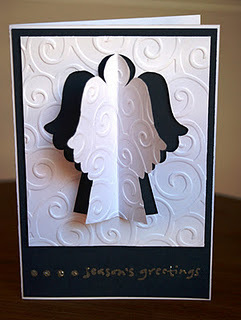 What a stunning focal point for this card! I love the little leaves in blue and silver that accent the flower. The sentiment framed by silver and strung with bakers twine gives it an unexpected little touch of red that is just fantastic. The overall texture and gorgeous flower make this a clean, simple and fabulous card. Congratulations Vicki, you're my choice for Cut Above! Paula's clean and simple layout caught my eye this week! 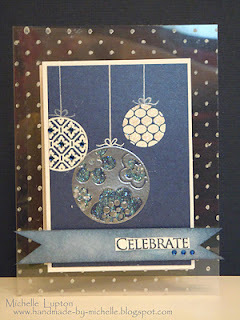 I love the way she used the twine around the image and the acetate sheet to add a shine factor to her beautiful card! The church scene looks lovely stamped in silver and the sentiment embossed with white really pops! Of course, her pretty bow and the brads all add to the lovely elegance of this card! Congratulations Paula on being my choice for Cut Above this week. I am drawn to Clean & Simple designs so it comes as no surprise that I was drawn to Erika's card right away. All of the white space and these beautifully scored lines have created quite an elegant card. I also adore snowflakes. I love that Erika has added both white and silver snowflakes to the card. All of the yummy layers and that gorgeous medallion are the perfect finishing touches. Erika, congratulations on being my Cut Above this week! 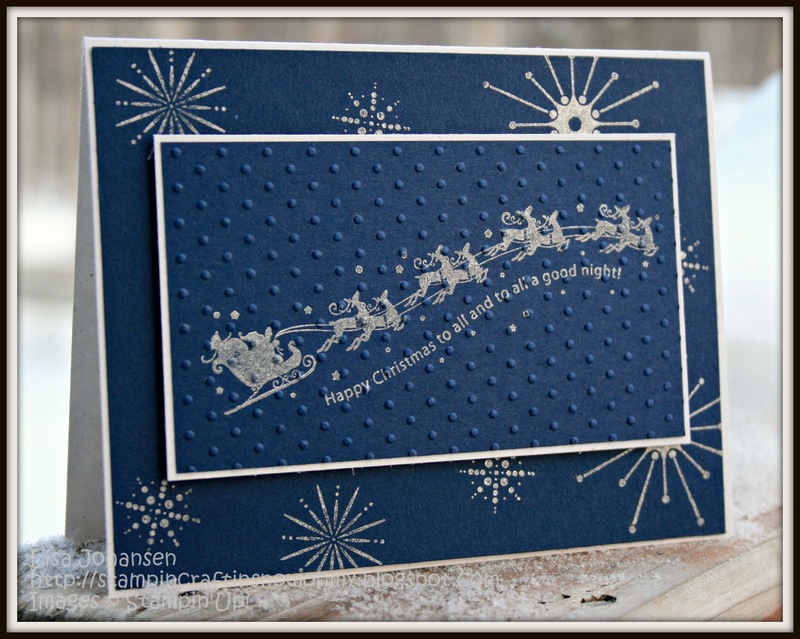 Stampin', Craftin', Snow, Oh My! 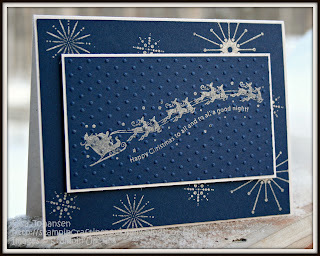 There were SO many awesome creations this week, again, it was a tough decision, but once I saw this silhouette Santa along with those pretty silver snowflakes, I knew I had my choice! This brings back many childhood memories of "Twas the Night Before Christmas", with Santa flying across the sky, and the excited feeling a wee one gets when they go to bed on Christmas eve! Thanks, Lisa, for creating such a sweet card and congrats on being my Cut Above! Michelle's holiday card completely caught my eye this week! I just love how she used the circle stamps to create such fabulously festive ornaments. The silver embossing and the sparkly details were the perfect finishing touch. I also love how she used the clear window sheet as her card base. Very pretty! Congratulations to you Michelle, on being my pick for A Cut Above this week! Vicki's card rocked the challenge! I loved her choice of image. 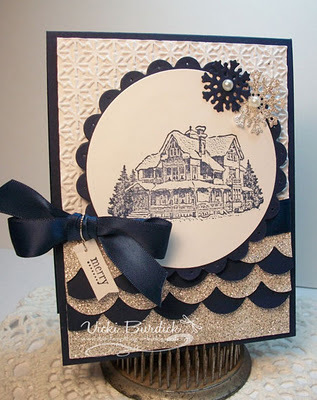 The embossed background and the layers of scalloped navy and silver trim created a beautiful base for her card. For the finishing touches, a beautiful navy bow and pretty snowflakes with pearl centers are just perfect. Congratulations, Vickie! Your card is my Cut Above for this week. WOW! Jenny's CAS moonlit winter scene is jaw-droppingly gorgeous. As we Brits would say, I was gobsmacked when I saw this card! 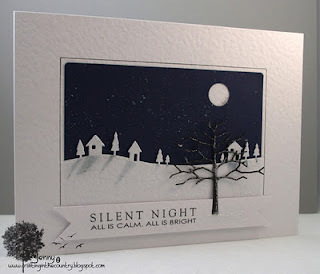 There are so many little details that went into this card and I found myself looking at it again again: The textured card stock; the silver border; the full bright moon; the snowflakes in the night sky; the long shadows cast along the snowy hill; the bare tree; the little icy speckles in the snow. The finishing touch is the fabulous sentiment - perfect for this peaceful winter scene. Jenny, congratulations on being my Headliner choice this week. Thank you to all who participated...you amaze us each week with your talent. Be sure to join us tomorrow to see what Lesley has in store for you! Thanks for stopping by! great picks for winners this week! beautiful ards! I am so honored to be A Cut Above, thank you so much! All of these cards are completely spectacular. Thanks for the awesome challenge and inspiration. Wow LeAnne, thank you! I am so glad you liked my card and that it brought back childhood memories for you as well! You totally made my night! Thank you for choosing my card as a cut above. You have made an Australian girl very happy. Such awesome cards this challenge, I think I will be casing many of them. Thank you again. Amazing inspiration from everyone :) Thank you so much for chosing my card as A Cut Above, very much appreciated! Thanks for choosing my card this week as a cut above. I love these colours together - you girls have great challenges where I get lots of inspiration.